Choose themes specifically designed for pet care and pet sitting. Whether you are a one person shop or have a full staff, your site will be professional and express the personality of your business. and manage your appointments online. Never have to stop clipping a dogs nails to answer the phone again once you have an online scheduler to book your appointments for you. 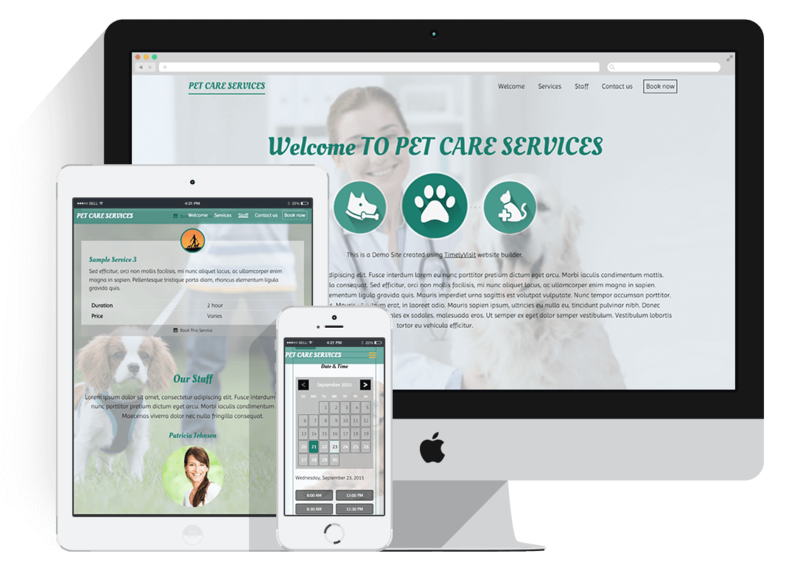 Our easy to use website builder will walk you through building your own pet care website. Then, it will guide you through setting up your online scheduler to free up more of your time to work with your furry clients. This web based service does not require that you download any additional software, and gives you access to your schedule, staff and clients from anywhere. Managing your doggie daycare business and staff has never been easier!